Our jalapeno plants went absolutely crazy this year. This is good when you want to make fresh salsa but when you want to preserve them, you must pickle them. We love pickled jalapenos with a pot of beans and they are great with fried chicken also. Try these if you have not, you'll be pleasantly surprised. This is What’s Cookin on Beaty’s today. 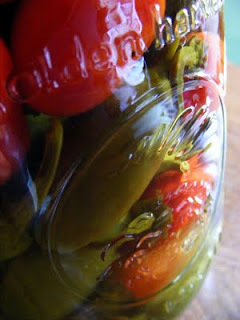 Pack jalapenos tightly into your jars. I used quart jars because we eat a lot of pickled jalapenos. Boil vinegar and pour over jalapenos in jars. Seal and process in a hot water bath for 12 minutes. Is there a reason why you couldn't r shouldn't use pickled jalepenos in salsa? I make my salsa very mild so wouldn't be likely to use more than one anyway.